The Missouri National Guard has a team in Afghanistan whose mission is to teach the local farmers how to farm, raise animals and find clean water. The Agribusiness Development Team IV came home today after a ten-month stay in Afghanistan. 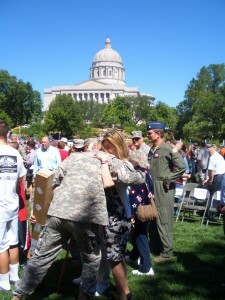 A National Guard member hugs a tearful family member. Adjutant General Stephen Danner says they are grateful for the work of the National Guardsmen here helping with disasters like the Joplin tornado, but to remember there are members serving abroad too – which is sometimes more dangerous because of the combat there. The team lost one member and had another injured. They were deployed for ten months, and now team five has taken their place to continue the same projects. Previous teams focused on mortar and brick issues, but Danner says this new approach should help the Afghani people get back on their feet, so that when troops leave the area, the Afghanis are self-sufficient.